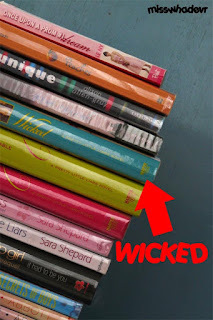 Pretty Little Liars #5: Wicked! I HAVE WICKED! Tari knows how excited I was when I saw the book on Periplus' display. After spent the last couple of days reading Wicked, it's a good time to go back to Blue Bloods. Wicked was perfect! And happy holiday. I'm leaving for 3 days. Awesome!